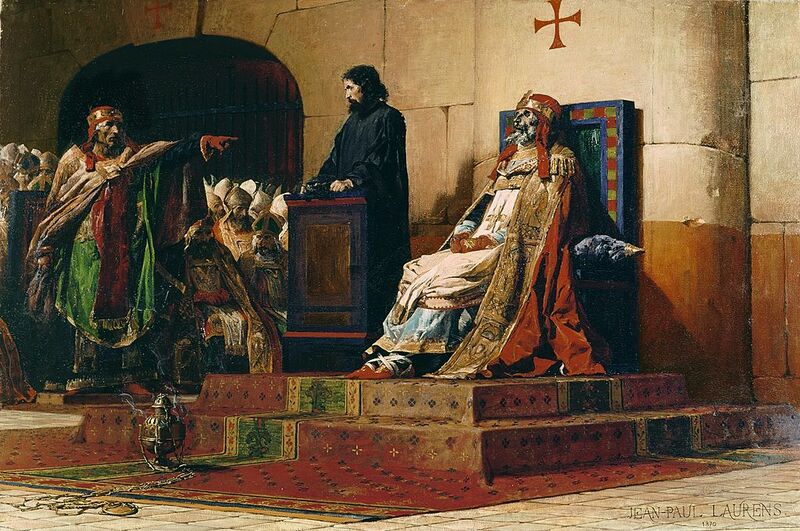 “Pope Formosus and Stephen VII” – Jean-Paul Laurens’ depiction of the Cadaver Synod in 1870. The event this chronicler is talking about is the notorious Cadaver Synod, when one Pope put on trial the corpse of one of his predecessors. Perhaps the lowest point in the history of the Papacy, the story of this trial is as murky as it is strange. However, recent work by historians is starting to shed light on his this could have happened. The accused in the Cadaver Synod was Pope Formosus, who occupied the Papal throne from 891 to 896. Before becoming Pope, Formosus had an eventful ecclesiastical career, serving as Bishop of Portus. He gained some success in converting the Bulgarians to Roman Catholicism, but this also made him some enemies within the Papal court – he was accused of plotting to become the Archbishop of Bulgaria, even seeking the Papacy too, and was excommunicated by a previous Pope. However, when that Pope died he was restored to his bishopric and later on was elected to become the new Papal leader. Meanwhile, in the rest of western Europe the Carolingian Empire was near its end. Attacked in the north by the Vikings, and in the south by Muslim raiders, the once powerful state was failing. After seven years of inept rule, Emperor Charles the Fat was deposed, dying just a few weeks later. However, no strong ruler would take his place, with several men taking their share of the empire. The chronicler Regino of Prum expertly sums up the situation in the year 888, following the death of Charles the Fat. After his death the kingdoms which had obeyed his authority, just as though a legitimate heir were lacking, dissolved into separate parts and, without waiting for a natural lord, each decided to create a king from its own guts. This was the cause of great wars; not because the Franks lacked leaders who by nobility, courage and wisdom were capable of ruling the kingdoms, but rather because the equality of descent, authority and power increased the discord among them; none so outshone the others that the rest deigned to submit to his rule. For Francia would have produced many leaders capable to controlling the government of the kingdom, had not fortune equipped them to destroy each other in the competition for power. Pope Formosus would be enemies with Guy III of Spoleto, the Holy Roman Emperor, and according to one source he convinced Arnulf of Carinthia, King of East Francia, to invade Italy and push Guy away from Rome. In exchange, the Pope crowned Arnulf the new Emperor at a ceremony in Rome on February 22, 896. On April 4, 896, Formosus died and was buried in a Roman church. His immediate successor was Boniface VI, but he only last 15 days on the Papal throne before dying of gout. He would be replaced by Stephen VI, a longtime rival of Formosus. As this was happening, Emperor Arnulf suffered a stroke and returned home north across the Alps. His health would never recover and he died on 8 December 899. In January of 897, Pope Stephen VI ordered that the tomb of Formosus be opened up and his body exhumed. He wanted the former Pope put on trial, allegedly for supporting King Arnulf in becoming Emperor, and for coveting the Papacy years before. He was charged with breaking canon law, as well as of perjury, and of illegally serving as a bishop. Even if Formosus had been dead for several months, Stephen was eager to have his revenge on his corpse. The macabre and bizarre spectacle would soon reach its foregone conclusion – Formosus was found guilty. His body was stripped of its Papal vestments and three of his fingers were cut off from his right hand – those that he used to bless people. Finally, the body was tossed in the Tiber River, however the next day it was recovered by some monks and secretly buried in a monastery. William Monroe, speaking at the 2016 Annual Meeting of the Medieval Academy of America, offers another theory on why the Cadaver Trial took place. He believes that when Arnulf of Bavaria entered Italy he actually forced Formosus to crown him emperor. The fact that the Pope died just five weeks later hints it might not have a natural death. Some evidence suggests that in the months following his death, Formosus was being viewed as a martyr and saint by the Romans. Meanwhile, the new Pope, Stephen VI, was a creature of Arnulf, according to Monroe. However, when Arnulf became sick and abandoned Italy, Stephen began to fear the wrath of Lambert, the son of Emperor Guy III of Spoleto. Therefore, he decided to put the body of Formosus on trial as a kind of peace offering. The act also nicely synced with his own hatred for his predecessor, hoping that it would prevent him from becoming a saint by having his bodily destroyed. If that indeed was Stephen’s plan, it would not save him. Within months Lambert had returned to Rome, and the Pope was imprisoned and strangled to death. A new synod was created, which destroyed the records relating to the Cadaver Synod, and proclaimed Lambert as emperor. Meanwhile, the remains of Formosus was returned for a proper reburial. The terrible events of the Cadaver Synod seemed to have foreshadowed an era of decline within the Papacy. Throughout the tenth-century the Papal throne was fought for among local Roman elite families, who would bribe and kill each other. Several Popes would be murdered, others found themselves caught up in scandals. It would not be until the reforms of the mid-eleventh century the Papacy would regain some of its respectability and importance.